The shell of a dead snapping turtle can be an interesting ornamental piece, in the right kind of environment. It can be a simple process to preserve the shell for an extended period of time. 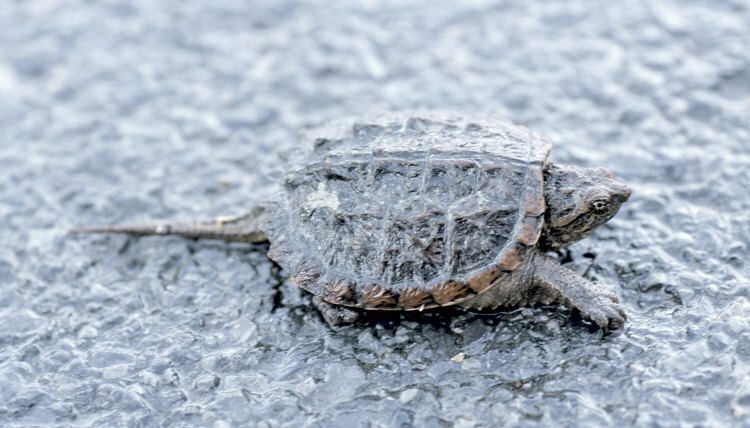 Whether you've caught the snapping turtle alive, or just found the shell discarded by a pond, you can apply the same principles listed in this article. By using the right techniques, having a little patience, you can have a preserved snapping turtle shell in a short time. Clean the snapping turtle shell. If the animal's carcass is still inside the shell you will need to remove it with a knife or set it outside where flies and other insects can clean the shell out for you. Remove as much of the carcass as you can. Let the shell dry for at least a week after the carcass has been removed. This will make it much easier to remove the remaining flesh and bones from the inside of the shell. Clean out the inside of the shell using a toothbrush and water. Using rubber gloves, gently scrub out any remaining organic matter out from the inside and the edges of the shell. Let dry until the water has evaporated. Coat the inside and the outside shell in lacquer and let sit until the lacquer has dried. This will preserve the shell and make it resistant to damage. Anyone know how to preserve a snapping turtle shell?